The Federal interagency community has developed 15 all-hazards planning scenarios (the National Planning Scenarios or Scenarios) for use in national, Federal, State, and local homeland security preparedness activities. The Scenarios are planning tools and are representative of the range of potential terrorist attacks and natural disasters and the related impacts that face our nation. The objective was to develop a minimum number of credible scenarios in order to establish the range of response requirements to facilitate preparedness planning. Since these Scenarios were compiled to be the minimum number necessary to develop the range of response capabilities and resources, other hazards were inevitably omitted. Examples of other potentially high-impact events include nuclear power plant incidents1, industrial and transportation accidents, and frequently occurring natural disasters. 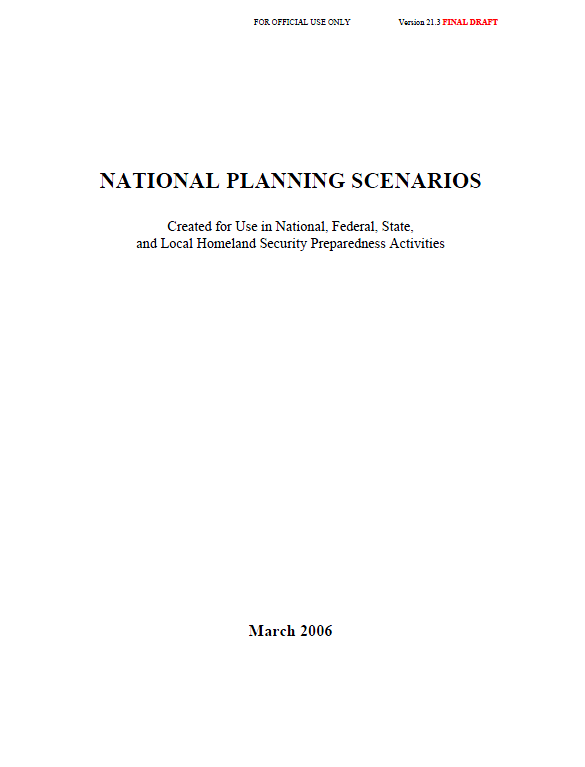 Entities at all levels of government can use the National Planning Scenarios as a reference to help them identify the potential scope, magnitude, and complexity of potential major events. Entities are not precluded from developing their own scenarios to supplement the National Planning Scenarios. These Scenarios reflect a rigorous analytical effort by Federal homeland security experts, with reviews by State and local homeland security representatives. However, it is recognized that refinement and revision over time will be necessary to ensure the Scenarios remain accurate, represent the evolving all-hazards threat picture, and embody the capabilities necessary to respond to domestic incidents. 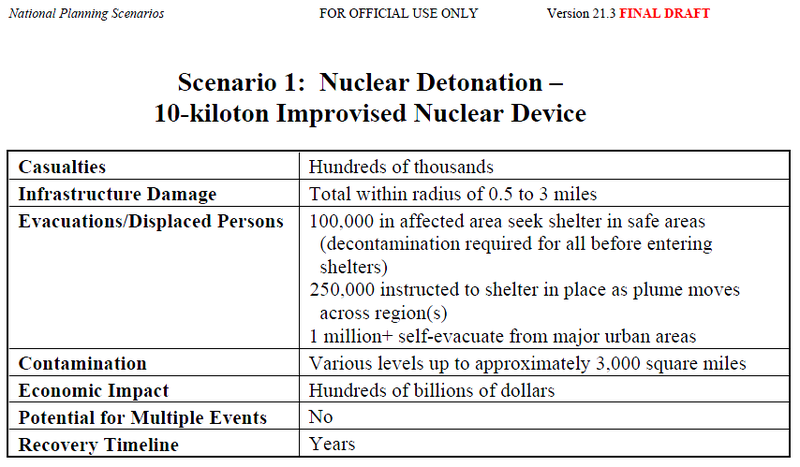 This appendix describes a set of possible consequences calculated for a 10-kiloton nuclear blast including its prompt effects (occurring within the first minute) and fallout. It should be emphasized that the results of this calculation are strongly dependent on the initial assumptions. This report is intended to assist in preparing to address the consequences of a terrorist attack, so the assumptions used in this calculation are conservative and produce an upper limit on the number of fatalities and casualties that might be expected. 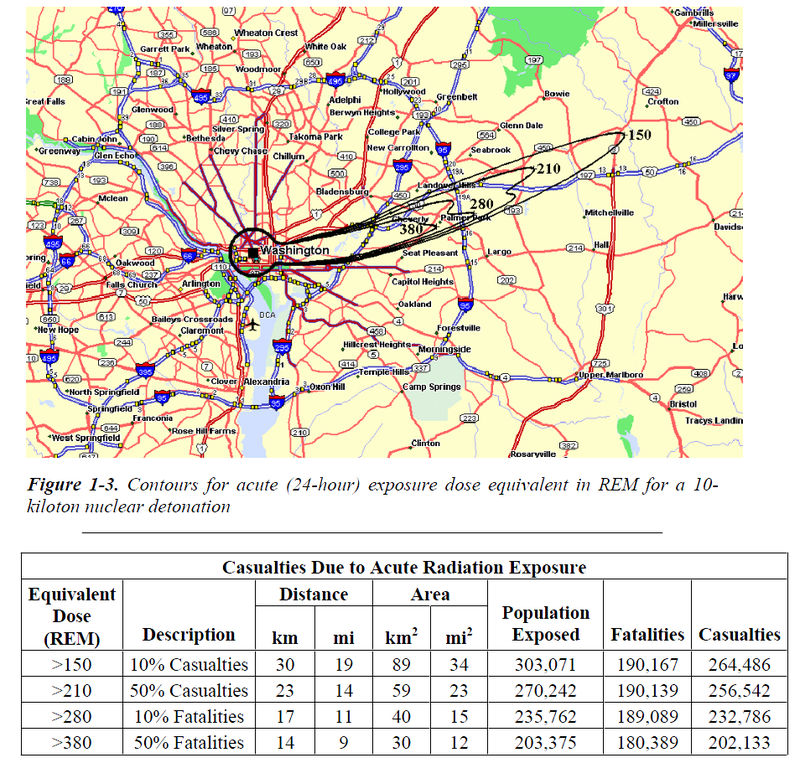 The results of the calculation reported in this appendix are from the detonation in the central business district of Washington, DC, of a 10-kiloton uranium-235, gun-type nuclear device. Table 1-1 summarizes selected input parameters for the calculation. The actual meteorological data used in the calculation consisted of wind speed, direction, and temperature as a function of altitude. These data were determined as typical by examining both surface wind and upper air measurements recorded at the city’s airport over the course of a year. The detonation is assumed to take place during working hours (10:00 a.m.) on a weekday. The population distribution is based on U.S. Census (nighttime) data, with two additional population densities added in order to represent the workday influx into the center of the city. Specifically, 481,000 people were added inside a 5-kilometer (~ 3-mile) radius of the detonation site, and 220,000 additional people were added inside an 11-kilometer (~ 7-mile) annulus with an inner radius of 5-kilometers (~ 3 miles).